OPTIONS YOU LIKE, RATES YOU CAN AFFORD. Whether you are looking for a new car, used car, motorcycle, boat, snowmobile, ATV or RV, we are your one-stop-shop for all of your borrowing needs. We think your borrowing experience should be as easy and rewarding as possible, and we’ll do all we can to set you up with the payment structure that works best for you. We offer convenient payment options, such as a monthly coupon book, cash payments, monthly transfer from your Credit Union Savings, payroll deduction, or direct deposit. To apply for a loan, you can visit one of our seven locations, or apply online. YOU DESERVE THE BEST RATE. If you received a notice from us requesting evidence of current insurance, because it is required as a condition of your loan agreement, please use this secure site to submit proof of insurance, check the status of your submission, or view the insurance history of your loan. You can also find answers to the most commonly asked questions about the insurance reporting process. Shopping for a car can be a complicated, stressful experience. What if you could find help to make the process easier? 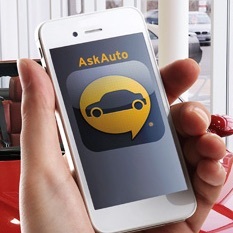 Now you can, with our new AskAuto app for your smartphone or tablet. The AskAuto app is a powerful research and lending tool that can help you shop for your dream car and apply for a great loan through Mountain Laurel Federal Credit Union. The app is easy to use. Let’s say you’re out shopping for vehicles on Sunday afternoon and see three cars that you like. Simply scan the VINs into your mobile device to get the average retail cost, EPA mileage estimates and make notes about each vehicle. The AskAuto app saves the information so you can compare later. While you are on the lot, we can even send you messages about available loans or dealerships we have good partnerships with, giving you good, trustworthy information right when you need it. Once you have decided on your car, apply for your loan anytime, anywhere using your smartphone or mobile device. Just scan your driver’s license* and let the AskAuto app do most of the work for you. Your loan application will prefill your personal information and the vehicle information you saved earlier. With the AskAuto app, you will stay organized, save time and have information to make an informed purchase right at your fingertips. Want to take the AskAuto app for a spin? Download today at askauto.loanliner.com/market . Be sure to select Mountain Laurel Federal Credit Union on the app’s startup screen. Driver’s license scan not available in all states. NADA – MAKE AN INFORMED DECISION. Consider visiting NADAguides.com, a leading vehicle information website, to discover vehicle values and specification information at the click of a mouse. Powered by the editorial experts at N.A.D.A., a 70-year-old vehicle information publishing company, NADAguides.com is known across the country for its market-reflective vehicle information, including data for classic cars, boats, motorcycles, RVs, ATVs, personal watercraft and more.